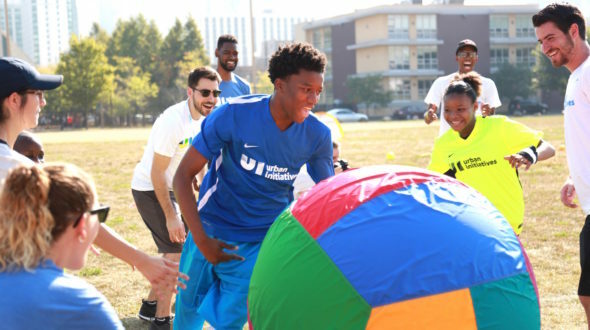 Since 2003, Urban Initiatives has empowered Chicago’s youth to become community leaders through academic success, healthy living, and social-emotional learning. They heighten the inherent power of sports and teamwork to unify diverse stakeholders and strengthen communities throughout Chicago. Urban Initiatives believes building a brighter future for Chicago’s youth is a team effort and lasting relationships are the keys to success. From staff and participants to supporters and the communities they serve, Urban Initiatives is a diverse, active, and proven organization. On Tuesday, October 10, 2017, Urban Initiatives launched their rebrand and new logo. As Urban Initiatives developed their new look, they wanted to create a visual representation of unity. Participants, families, schools, supporters, and staff are representative of the diversity that makes Chicago strong. Each stakeholder on their team is critical, and only with all the pieces in place do we have the Urban Initiatives team. The new Urban Initiatives logo is a mosaic that highlights the Urban Initiatives of today and their vision for the future. While they continue to expand their vision, network, and scope, they remain true to their roots at every step. Their commitment to building a brighter future for Chicago’s youth is stronger than ever.